It’s not often that one gets to create something unique in the kitchen. Most of our recipes are based on those created by others, with modifications and adjustments to ingredients and quantities. An ice cream or gelato recipe easily falls into this category whereby most approaches are derived from basic vanilla, but I think my almond milk ice cream (more correctly almond milk gelato) is bordering on the invention side. Well, perhaps. The great thing about using almond milk for gelato or ice cream is that almond milk is healthy, nutritionally dense, vegan and lowers your cholesterol. The trick, however, that while normal cow’s milk is totally understood when it comes to the frozen dessert, there are no easily available resources out there that explain how almond milk reacts in ice cream making. As you may know, successful ice cream and gelato making is all about achieving a balance between sugar and fat, both of which play a part in ensuring the ice cream does not freeze to a solid block full of huge ice crystals and that it has a good, creamy mouth feel. Egg yolks add to the fat content and are the key distinguishing factor between an ice cream (contains egg yolks) and gelato (contains no egg yolks). Additives such as sahlep, cornstarch, xanthan gum or guar gum increase the ratio of solids to liquids in an ice cream, which lowers its freezing point without adding too much in terms of fat derived calories. Alcohol and egg whites are also useful, but result in a “slushy” ice cream if not carefully balanced. And so, my key target was to naturally raise the content of “good” fats in the ice cream by extracting concentrated, rich almond milk, and by further enriching it with the fats from the pistachio nuts. Then the sugars need to play their normal part. I used 80 grams of sugar and 80ml Agave nectar. I like Agave because it is low GI and it is already in a liquid state, which assists in lowering the freezing point. Thickening the mixture with cornstarch is standard gelato business and the result is a smooth, nutty and 80% healthy almond milk and pistachio gelato. Enjoy it before it gets too cold. Sounds delicious! I have told myself I won’t get and ice cream churner because of all the ice cream I will subsequently eat, but this healthy version may change my mind. Your photos are getting better and better! .-= lili – pikeletandpie´s last blog ..Vientiane Dining =-. 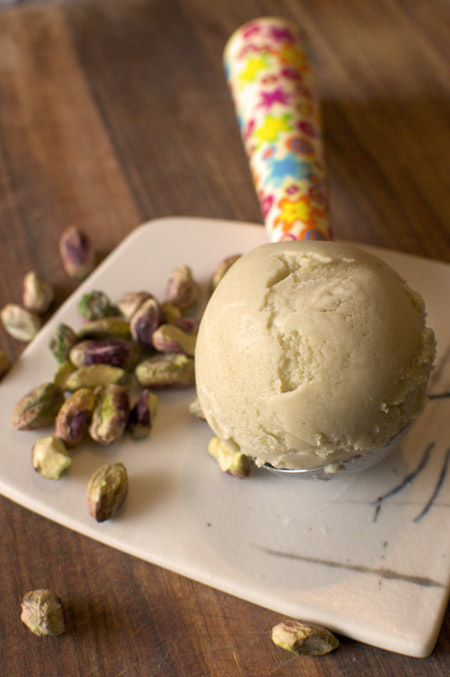 I love making my own almond milk — and pistachio ice cream is my favorite! Never stumbled upon a vegan alternative to the delicious creamy treat but this… this looks so good. .-= Samantha´s last blog ..Lunch =-. This sounds wonderful and I love that you used whole almonds and not pre-fab almond milk. I’ve been looking for the perfect non dairy ice cream recipe and I think this might be it, thanks!! Thanks! My high cholesterol level makes me sooo guilty when I indulge in ice-cream..which is more often than I should. Your recipe makes me so happy. Looks delicious- I love this idea and can’t wait to try it! .-= dirtygourmet´s last blog ..Chunky Roasted Red Pepper Dip =-. Sounds gorgeous. I won’t buy an ice cream machine either. It’s a dangerous proposition! I love your recipe! Would you believe I have never had almond milk! I need to check it out and your recipe is the perfect excuse! No fat, no cream, I mean it is the best! .-= tasteofbeirut´s last blog ..Spaghetti with fava bean and yogurt sauce =-. .-= Viviane´s last blog ..Seafood Jambalaya for Easter Lunch =-. 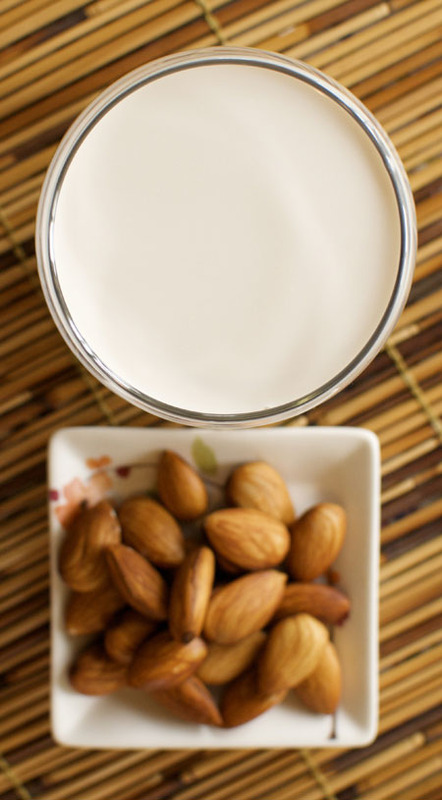 Such a great idea to use almond milk for this non-dairy alternative. Love your simple explanation of how the ice cream making process works. I’m ready to lower my cholesterol anytime!